What really went wrong with Jake Gyllenhaal and Taylor Swift? Taylor Swift and Jake Gyllenhaal dated from October to December 2010. That's not that long, but in Taylor Swift years, it's practically an eternity. What went wrong with these two "twin fire signs?" It turns out, a lot. Maybe that's why it's such a touchy subject for him these days! When they dated, Gyllenhaal was 29 to Swift's 20, and by the time they split, he was 30 to her 21. "He said he could feel the age difference," a source told Us Weekly. A source added to Hollywood Life that though Swift was mature for her age, "When Jake broke her heart, she was so inexperienced she didn't know how to deal with it … She wasn't used to all the head games and the lies, but now she's way less naive." Part of why Gyllenhaal and Swift split? He didn't want to get serious. "Jake just told her it wasn't working out," a source told Us Weekly. "Taylor is really upset and hurt. She doesn't know what she did for him to put a stop to it. She feels really burned by him." In an interview with Howard Stern (via The Daily Mail) in July 2015, Gyllenhaal admitted that he'd been in love twice in his life (leading most to believe it was with Kirsten Dunst and Reese Witherspoon, each of whom he dated for about two years). When Stern asked why he hadn't settled down yet, he replied, "I think I probably just got scared … There are a lot of beautiful women, there are opportunities, but I think at the same time, if you find the right person, I believe in monogamy, I believe in when you meet somebody who is right it will be right and you will stay there." Indeed, less than a month after he and Swift split, a source told Us Weekly that Gyllenhaal was pretty much behaving like a tomcat at the Golden Globes. "He was talking to so many girls," the source said, adding that the ladies included Mila Kunis, Michelle Williams and Scarlett Johansson. Gyllenhaal and Swift broke up before the holidays in 2010 after just two to three months together, but People reports that they briefly reunited in January 2011, then had an intense run-in at the Oscars in late February 2011. A source told Us Weekly (via Celebitchy) in late January 2012 that all the couple's on-again-off-again drama really damaged Swift. "She's haunted by that relationship. He totally screwed with her mind," the source said, adding, "She doesn't know how to meet anybody new." She later told El Hormiguero (via Hollywood Life), "I think once a relationship is done it's done, you can't do that back and forth thing — it's the most exhausting process. I think you have to have somebody that's dependable, that isn't going to change their mind every five seconds." Swift admitted to NPR that her collaboration with Snow Patrol frontman Gary Lightbody, "The Last Time," was inspired by an intense on-again-off-again romance that occurred around the time she was with Gyllenhaal. "The idea was based on this experience I had with someone who was kind of this unreliable guy. You never know when he's going to leave, you never know when he's going to come back, but he always does come back," she said. Believe it or not, some reports suggest that Gyllenhaal still carried a torch for Swift for years after their breakup. In summer 2015, a source told The National Enquirer, "Jake knows he screwed up the first time around. He wasn't ready for a commitment but now Jake's wooing Taylor via emails and texts… No guy has ever promised so much to Taylor, so she's very intrigued — and ready to see if Jake has what it takes for the long haul!" That November, a source told Star (via Life & Style) that Gyllenhaal enlisted mutual pal Cara Delevingne to reignite their old flame. Of course, Swift was dating Calvin Harris during that period, so not much came to fruition for him. "Jake reached out to her and started all of this, but now he's not acting as interested," a source told Us Weekly. "He said he wasn't feeling it anymore and was uncomfortable with all the attention they got." A source close to Gyllenhaal added, "Jake cares about her, but [the publicity] was a lot for him. He wants to keep his private life private, and that's hard to do dating Taylor." She hinted to Vogue that this was part of the catalyst for one of her breakups, venting, "Also, I can't deal with someone who's obsessed with privacy. People kind of care if there are two famous people dating. But no one cares that much. If you care about privacy to the point where we need to dig a tunnel under this restaurant so that we can leave? I can't do that." Another part of why Swift and Gyllenhaal may have had trouble with alone time? Her bodyguards. She explained, "If a dude is threatened by the fact that I need security, if they make me feel like I am some sort of princessy diva — that's a bad sign. I don't have security to make myself look cool, or like I have an entourage. I have security because there's a file of stalkers who want to take me home and chain me to a pipe in their basement." A source told Radar Online that Gyllenhaal skipped out on Swift's 21st birthday party, leaving her to feel like "damaged goods. ""The day before — all was set — he was coming, no issues. But the day of, she doesn't hear from him at all. No texts, no calls," the source said. "Taylor thought maybe he was planning some sort of surprise. Nope. He didn't show up and she locked herself in the bathroom and cried the entire night … The song that specifically references this 'event' is 'The Moment I Knew.' The lyrics are all about her birthday party and Jake not showing up." In "We Are Never Ever Getting Back Together," which is widely rumored to be inspired by her romance with Gyllenhaal, Swift sings, "I'm really gonna miss you picking fights / And me falling for it screaming that I'm right / And you would hide away and find your peace of mind / With some indie record that's much cooler than mine." She noted to Vogue that one of her exes often demeaned her, and the context makes it seem like it could apply to Gyllenhaal's alleged pretension when dating her. "If you need to put me down a lot in order to level the playing field or something? If you are threatened by some part of what I do and want to cut me down to size in order to make it even? That won't work either," she fumed. She later told The New York Times, "That [lyric from 'We Are Never Ever Getting Back Together'] came out of this one relationship I was in. This guy was just, so, so cool. It kind of gave me a bit of a complex for this album, because he was always going on and on about this new band that was so cool because they were so underground." Swift spoke of a particular "red flag" in her January 2012 Vogue interview that made it seem like Gyllenhaal was infatuated with the idea of her, but not with her genuine character. "If someone doesn't seem to want to get to know me as a person but instead seems to have kind of bought into the whole idea of me and he approves of my Wikipedia page? And falls in love based on zero hours spent with me? That's maybe something to be aware of," she griped. "That will fade fast. You can't be in love with a Google search." Swift and Gyllenhaal spent Thanksgiving 2010 together, much to the chagrin of her own family. "Jake invited her to New York [for Thanksgiving]," a source close to Swift told Us Weekly (via Hollywood Life). "It wasn't planned in advance, but she said, 'Why not? I can do it, and I'm going.' Her parents weren't thrilled, but she explained to them that she gets to see them all the time and wasn't able to spend much time with Jake during the publicity madness." The source added, "There was no diva behavior [with his family]. She pitched in to cook and and clear the dishes. She also seemed very interested in the family and asked them a lot of questions about themselves." It seems like perhaps Swift's family saw something that rubbed them the wrong way about union, but they couldn't stop her from doing what she wanted. 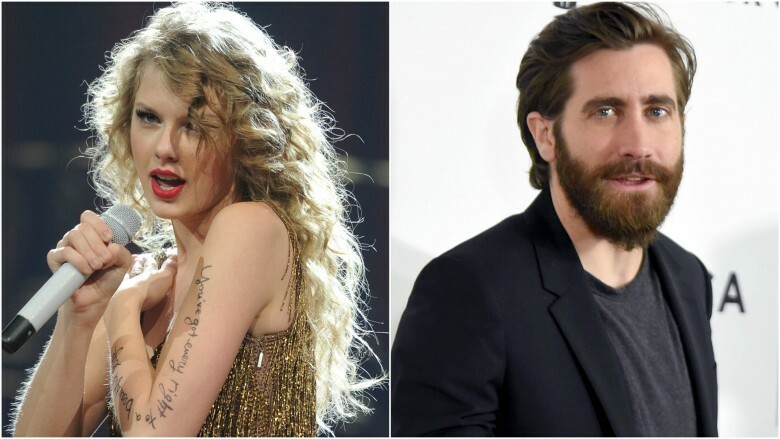 A friend of Swift told Us Weekly that the singer fell too hard, too fast for Gyllenhaal. "Taylor is really upset [with the breakup]. We told her not to move so fast with this, but she didn't listen." Swift herself told Vogue in early 2012 of the split, "There's just been this earth-shattering, not recent, but absolute crash-and-burn heartbreak, and that will turn out to be what the next album is about. The only way that I can feel better about myself — pull myself out of that awful pain of losing someone — is writing songs about it to get some sort of clarity." A source revealed to Radar Online that part of why Swift was so devastated by the split is because she gave Gyllenhaal her virginity. "[Swift] was saving herself for marriage," the source said, adding that Gyllenhaal eventually talked her into going all the way. "She thought she was going to marry Jake, that's how in love she was with him."